Pádraig Mac Loclainn said that GSOC had to delay investigating a complaint made by the family of Seamus Doherty due to a lack of cooperation from gardaí in Donegal. PÁDRAIG MAC LOCHLAINN has informed the Dáil that a murder investigation complaint instigated by the family of Seamus Doherty has been delayed due to a lack of Garda cooperation. Doherty (67) was found dead in his bathroom in the early hours of 17 June, 2012. It was initially thought that he died as a result of an accident or suicide. However, following a post-mortem examination carried out by the State Pathologist Professor Marie Cassidy two days later, it was established that he died in suspicious circumstances. He lived in Drumacnoo, near the village of Churchill, in Co Donegal. Unhappy with how the gardaí preserved the scene of his death and handled the subsequent investigation, his family made a complaint to the Garda Ombudsman (GSOC). Mac Lochlainn said that the family’s solicitor told them the complaint had been delayed due to a lack of Garda cooperation. Sinn Féin’s Justice Spokesperson noted that it was three days before a murder investiagtion was launched, despite “signs of an assault on [Doherty's] body” and evidence of “some type of struggle” in the bathroom. Responding to his comments, Justice Minister Frances Fitzgerald said GSOC had told her that “issues had arisen” in terms of getting necessary documents from gardaí dealing with the murder but said this had since been resolved. “I do regard full cooperation of the gardai with GOSC as extremely important,” Fitzgerald said, adding this was something that has to be “worked on”. Also in the Dáil today, Fianna Fáil Justice Spokesperson Niall Collins said that the chair-designate of new independent Garda authority should play a role in appointing the next Garda Commissioner. Fitzgerald assured Collins the two issues were ”developing in parallel”, adding that she expected both to be finalised by the end of the year. She said that advertising the Commissioner position internationally would ensure “transparency” and lead to applications from “candidates of the highest calibre”. However, she acknowledged the process would be slowed down as a result. When Collins questioned her on how a whistleblower would be treated within an Garda Síochána today, she said that acting Garda Commissioner Nóirín O’Sullivan was implementing changes in this regard. “Certainly one can never be absolutely sure … with how organisations deal with whistleblowers. We’re learning,” the minister remarked. Email “Dáil hears lack of Garda cooperation stalled murder investigation complaint”. 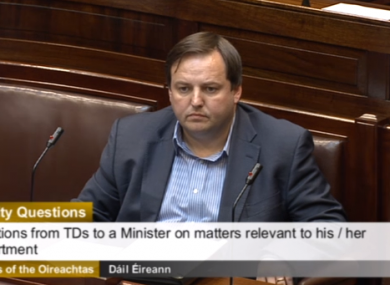 Feedback on “Dáil hears lack of Garda cooperation stalled murder investigation complaint”.